On December 9, 1991 Rick Walker was convicted and sentenced to twenty-six years in prison for a murder he did not commit. Linked to the crime by false testimony and questionable legal tactics, Walker would spend the next twelve years in some of California's most dangerous prisons. $100 a Day is a compelling story of gross injustice, political partisanship and the heroic struggle to prove Walker's innocence. Once exonerated, he would face yet another barrier to justice—the California State Legislature. 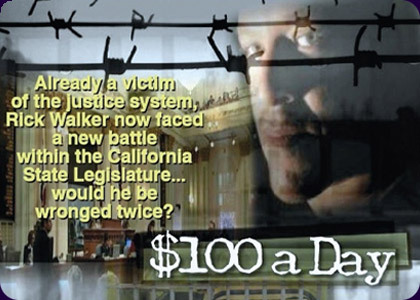 Entitled to one hundred dollars for each day spent falsely imprisoned, Walker would become a pawn in the annual partisan battle over the California budget. Many aspects of our political, judicial and economic systems operate within a win at all cost mentality, considering the consequences only when taken to task or exposed for wrongdoing. This cultural dynamic has plunged our economy into a tailspin, exacerbated political partisanship and pressured the criminal justice system to emphasize win/loss ratios. Ultimately, $100 a Day is about hope—hope that in one man's quest for justice lays the inspiration for our elected officials to govern with the true strength of their convictions. Gwen R. Essegian comes to documentary filmmaking from cable television where she produced and hosted a weekly one hour, commercial-free political and public affairs program broadcast throughout the greater San Francisco Bay Area. As a freelance television producer, she scripted and directed a number of science, public policy and arts education programs. Mark Ligon has over 20 years of experience in broadcast and cable television as a director of photography, producer and editor. He has worked with a number of US broadcast affiliates and international channels and has directed, produced and shot for a variety of business, sports and financial clients. He is the recipient of Cable Magazine's Innovator Award and Cable Television Public Affairs Association's (CTPAA) Beacon Award for Public Service. Essegian and Ligon founded onTopix Productions in 2005.